After a long day at work, there’s nothing quite like heading home and watching TV for the next five hours. Or at least, that would be the case if Fairbanks didn’t have a healthy helping of after work activities to offer. Whether you’re looking to get that blood moving, set your taste buds alight or just, you know, do something different than what you did at work all day, Fairbanks is sure to satisfy. Here are our top 10 suggestions for making those after shift hours really count. After working a full day, you probably find yourself moving (and thinking) a little sluggishly. That’s a big “no” if we’re going to have ourselves an adventure-filled evening. Point your feet in the direction of the nearest coffee shop – College Coffee House and Alaska Roasting are two popular options – for a sip of freshly brewed coffee. 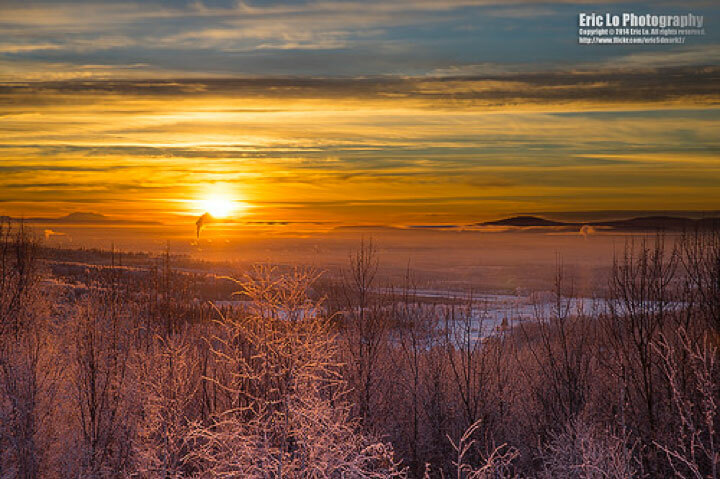 There’s a reason Fairbanks attracts outdoor enthusiasts from around the world: there are dozens of trails within easy reach of the city, each featuring their own special highlights. The Creamers Field Nature Trail, for instance, provides a good glimpse into the local flora and fauna, while the Wickershom Dome Trail (only 28 miles away) offers over 200 miles of traditional Alaskan hiking – take your pick! The city of Fairbanks features a number of bike-friendly paths, so renting a bike can be a great way to explore the city after hours. The hardwood forests of the UAF campus makes for excellent cycling, as do the Birch Hill Recreation Area and Chena Lake. Or load your bike into your car and head out to Two Rivers Elementary Trails, where you can explore up to 10 miles of trails. Don’t have a bike of your own? Rent one from Alaska Outdoor Rentals and Guides. From fine dining to your local neighborhood grill, Fairbanks features a wide range of grub that’s sure to satisfy your tastebuds. Establishments along the Chena River can be particularly appealing, as they offer decks with riverside views. There are also a number of good options downtown, and a few scenic choices just outside of town as well – all well worth the drive. Someone has to do it, right? Luckily, Fairbanks shops have much to offer, including art, jewelry, glass, crafts and books. Downtown shops feature a wide variety of stores, as do the shops at the indoor Bentley Mall. Knock yourself out! Enjoy rib eye? How about boats? You’ll combine the two as you float down the Chena River aboard the Sternwheeler Tanana Chief. The two-hour dinner cruise features a gorgeous sunset and the sparkling lights of Fairbanks on the way back to port. You haven’t really gotten to know a place until you’ve tasted its local brew. In Fairbanks, that mean heading to either Hoodoo Brewing Company or to Silver Gulch, which offer tastings of their fresh brews in their taproom. Hoodoo often sponsors local events, like Alaska Beer Week, and you’ll want to head to Silver Gulch for fresh Alaska Kachemak Bay oysters on Wednesdays. When the lights go down, Fairbanks locals know how to do it up right. From Swing to Foxtrot, the Fairbanks Ballroom Dance Club will keep your toes tapping, while Kodiak Jack’s Furthest North Rodeo Bar will have you two-stepping across the dance floor. The Blue Loon is also a popular option, offering karaoke, DJs and outdoor concerts (when the weather is right). You can always make your own dance floor at bars and music venues across the city, which often feature local and touring acts. When you’re looking for a dose of culture, the Fairbanks Light Opera is sure to satisfy; in fact, auditions are open to anyone who thinks they can sing, so if you really are looking for an after work adventure, it just might be here. The Fairbanks Shakespeare Theatre, Dance Theatre Fairbanks, and the Fairbanks Drama Association often put on great shows as well, so check your local listings. Looking for something a little more relaxing? If you’ve got enough time, drive out to Chena Hot Springs Resort to unwind. Your muscles won’t be able to help letting go of stress in those steamy waters, surrounded by snow or greenery, depending on the season. In Fairbanks, simply heading home to the TV isn’t an option. With so much to do and see, get out there and make the most of those after work hours!